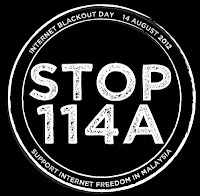 Support Our Internet Freedom and Stop #STOP114A! Today is August 14, Internet Blackout Day. 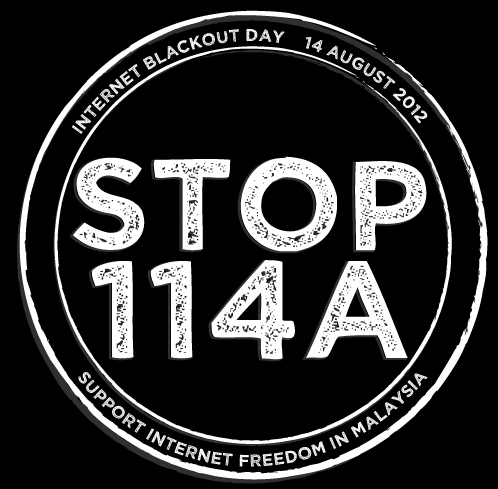 It also increase the awarnese #STOP114A and educate the Internet users in Malaysia about the negative impact of this amendment. The Section 114A wrongfully presumes the guilt rather than innocence of individuals possessing a web page or device on which seditious, defamatory, or libellous content is published. How will Section 114A affect the freedom of expression? Section 114A threatens the right to freedom of expression. Internet users may resort to self-censorship to avoid false accusations made under Section 114A. Bloggers, for example, may excessively censor comments made by their readers. As a result, Section 114A inadvertently stifles public discussion about pertinent political or social issues and protects public authorities, such as the State, from public scrutiny. Please visit the official blog of the campaign: http://stop114a.wordpress.com/ and join the Facebook group https://www.facebook.com/evidenceamendmentact.